Lots of space debris is orbiting Earth, including non-functional satellites. A bizarre object orbiting Earth is reminding astronomers of an empty trash bag. The unusual satellite is trekking around the planet in an almost absurd ellipse, dipping as close as 372.8 miles (600 kilometers) from the surface and then swinging out to a distance of 334,460 miles (538,261 km), or 1.4 times the average distance of the Earth to the moon. According to the observatories, the Haleakala (ATLAS-HKO) Observatory in Hawaii was the first to detect the object. The observatory is tasked with detecting near-Earth objects to warn of dangerous chunks that might impact the planet. This particular object is not dangerous, but it is weird. Scientists dubbed it A10bMLz. According to the Northolt Branch Observatories, it's what is known as an "empty trash bag object." That means it is large enough to be spotted, but very light. Scientists at the London observatory calculated that A10bMLz is several meters in width, but weighs less than 2.2 pounds (1 kilogram). Most likely, they wrote on the observatory Facebook page, the object is a bit of metallic foil flung into space during a rocket launch. It's not clear when A10bMLz entered orbit or what rocket took it spaceward. This is not the first empty trash bag object found in orbit, Northolt Branch Observatories reported, but it is possibly the strangest. No other "empty trash bag" has been seen orbiting so far out. Its current weird orbit is not likely to be permanent. The object has such a small mass, Northolt Branch reported, that photons emanating from the sun can easily push it around. For that reason, its orbit will likely change frequently, in unpredictable ways. It could even re-enter Earth's atmosphere and burn up in the coming months. Earth's orbit is full of space junk. About 500,000 individual pieces of debris circulate around the planet, according to NASA, and about 50,000 of the largest of those are tracked by the space agency and the U.S. Department of Defense. 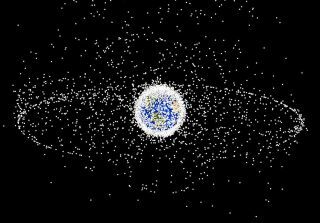 , Between 200 and 400 pieces of space debris reenter the atmosphere each year, according to the National Oceanic and Atmospheric Administration's National Environmental Satellite, Data and Information Service. Most of that junk burns up before hitting the surface of the planet. Two clouds of space dust called Kordylewski clouds may also be orbiting Earth, researchers reported last year.